On those really cold days I have a hard time getting out of bed. It’s too yucky to go outside and even if I wanted to, I would have to brush the mountain of snow off my car. These are the kind of days I like to use my slow cooker. The whole house smells delicious and it’s so tempting to not take a quick taste. I learned my lesson a few weeks ago when I burnt my chin after tasting a recipe. Now I’m patient for my own safety! 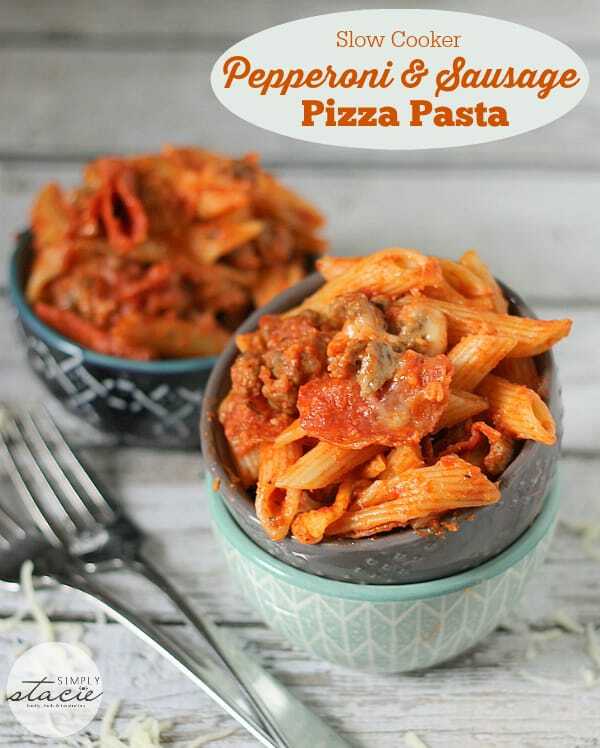 I’ve made Pizza Soup in the slow cooker and today I’ve got another easy slow cooker recipe to share for Slow Cooker Pepperoni & Sausage Pizza Pasta! 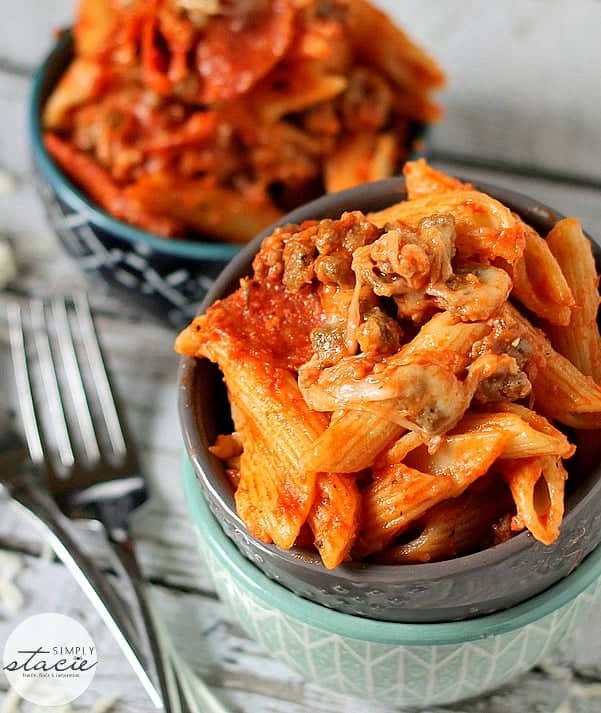 This another recipe where you can substitute your favourite pizza toppings if you aren’t fond of the ones in the recipe below. Experiment with it and try a variety of toppings. I’d like to make it with green pepper, bacon, mushrooms and pepperoni and called it a Deluxe Pizza Pasta. Have fun with the recipe and be creative as your heart (or tastebuds) desire! This is what I what call comfort food supreme! It will fill your bellies and leave you stuffed and satisfied. I wouldn’t want to eat this every night if you are watching your weight, but it’s a nice meal to enjoy when you are craving carbs. What will you add to your pizza pasta? 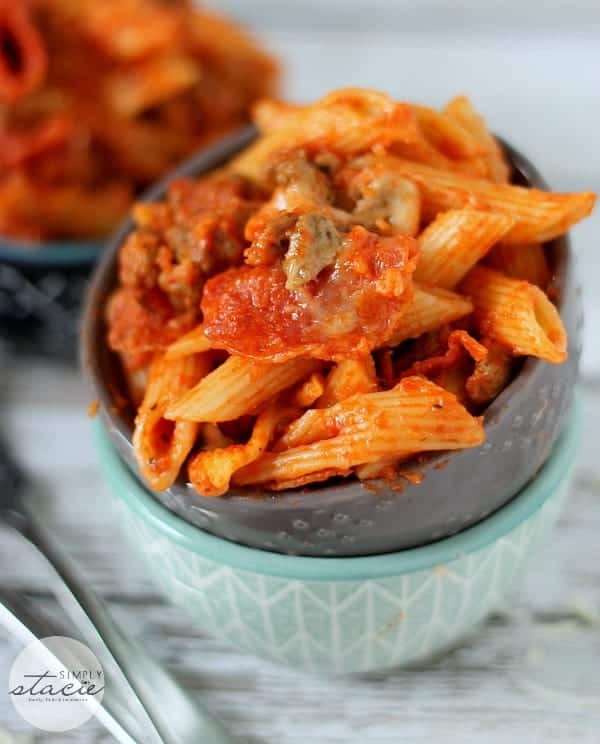 Satisfy your comfort food cravings with this Slow Cooker Pepperoni & Sausage Pizza Pasta recipe! In a large pot, cook pasta in boiling water for 6 minutes. Drain and set aside. In a medium bowl combine pasta sauce, tomato sauce, oregano, salt, and pepper. Stir to combine. Set aside. Spray your slow cooker with nonstick spray. 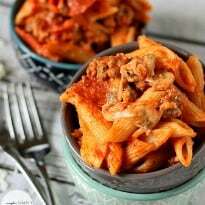 Add one cup of the sauce mixture to the bottom, add half the penne on top. Sprinkle half the pepperoni and half the sausage over the penne. Top with half of the mozzarella cheese and then 1 cup of sauce mixture. 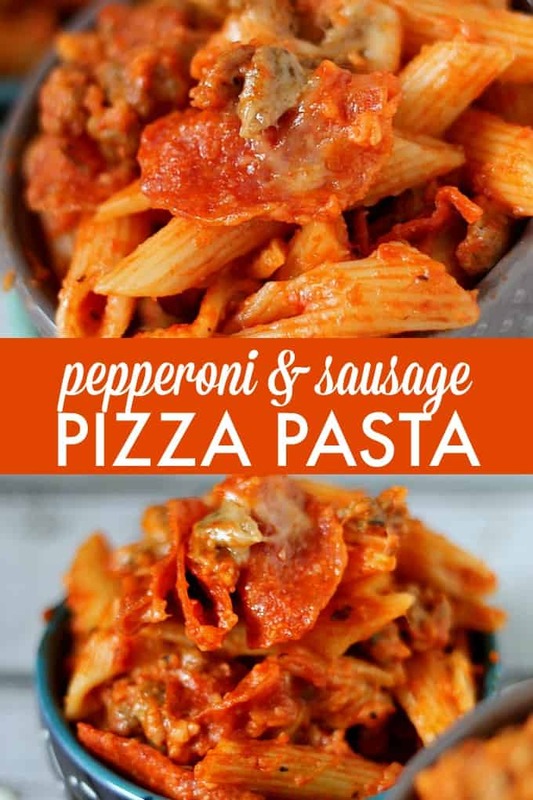 Repeat layers – remaining penne, pepperoni & sausage, handful of mozzarella (you should have about another handful left for the top), and remaining sauce. Top with remaining cheese. Cover and cook on high for 3 hours, or low for 4-5 hours or until heated through. When time is up, stir the pizza pasta to evenly coat with sauce and cheese. Spoon into bowls and enjoy! Breadsticks and salad make wonderful sides for pizza pasta. Feel free to add your favorite meats or veggies to this recipe as well – the ‘topping’ options are endless! This sure is a good looking recipe. I know it tastes so good!! This looks like it would make for a great dinner! You’ve got some of the best slow cooker ideas and the best part is, they’re so easy to make. This recipe looks delicious ! Thanks for sharing your recipe it looks delicious ! This looks so good – great for a rainy, cold day!